In the lead up to the 1999 World Cross Country Championships in Belfast, the English and Irish athletes of Providence College, Rhode Island could be found winding each other up about the event. That type of friendly rivalry meant much more to an American in the group, new to Anglo-Irish connections. Up to that point Gladys Ganiel hadn’t yet heard of Northern Ireland. The undergraduate, who had already forged strong ties with her college’s most prominent Irish coach Ray Treacy, developed an affinity for Irish history and in particular conflict resolution. Without trading one for another as is usually the case for most graduates, athletics and academia emerged as dual interests from which Ganiel could reach the heights of elite level distance running and writing books. Northern Ireland has since become home with the Maine born marathoner holding both Irish and British citizenship. Her analysis of politics at Stormont is as healthy as her most recent race in Glasgow at the Commonwealth Games. She sees the system of government and its mutual veto as serious faults of the post Good Friday Agreement period. “That system is really designed to produce deadlock and slowness. It’s not designed to encourage communities from both sides to co-operate and make a consensus.” Her sympathies toward those experiencing frustration with the pace of political progress are genuine. Falling short of outlining the main issues identified by the Haass talks, the 37 year old speaks of “the failure to come up with a way to deal with the past and the failure to look after victims properly.” When she mentions that those victims are being re-victimised, it is more an assessment taken from her many hours spent working with local religious figures and lay people than it is of succumbing to headlines of news print. Having finished her politics doctorate at UCD in 2005, Ganiel took up a visiting scholar position in Cape Town only to make her way back to the island when the position of lecturer and co-ordinator at Trinity’s Belfast based conflict and resolution programme opened. “I cancelled other job interviews I had lined up, Northern Ireland was exactly the place I wanted to be,” she says. The continued desire to grapple with religious and civic debates of a post conflict and post catholic Ireland, have witnessed a dedication to research projects with peers of international repute. Historical and sociological findings have included collaboration with American Gerardo Marti, for their recently published book ‘The Deconstructed Church: Understanding Emerging Christianity.’ In short, she says the book was written “so that people who are interested in some of the same hard questions emerging Christians asked about – the nature of truth, doubt and the nature of God – can identify with it or learn from it.” While some take heart from the spiritual overtones of her work, others marvel at her athletic achievements. What began as a high school running habit has been transferred to battered Belfast streets, across peace walls and the mountainous region that overlook the city’s skyline. A hardened training route that includes all three of these elements has been favoured by her North Belfast Harriers club for over thirty years. The area, from start to finish is particularly distinctive as it passes communities from both sides of the so called ‘religious divide’. A proud record of the run belonging to everyone rather than one side or other remains since the darker hours of ‘The Troubles’. Ganiel now adds her Commonwealth profile to the run “I do think it is something significant that an athletics club could do that, (run through the mentioned route), even at times when things were tense. They just got on with it and that in itself is testimony to the human spirit.” Missing out on representing Ireland at the 2012 London Olympics might have tested her own human spirit to its limit but improved performances over 10k, half and full marathon distances a year later, meant ambitions with Northern Ireland were sure to be realised. A 12th place finish timed at 2 hours 40 minutes on the Scottish streets was a welcome reward for maintaining tactical discipline among competitors who made rash judgments on their way to substandard performances. “No one ran a personal best apart from the Australian girls who ran really well. I was closest to my PB than anyone else in the race. Most of the girls were minutes slower than their PB’s so I feel I acquitted myself very well on the day, given the course conditions were a bit windy and the fact that I ran more than half the race by myself.” As a part time athlete competing at Glasgow, Ganiel relied on support afforded to her by the Sports Institute NI, with benefits ranging from access to strength and conditioning coach to free blood tests. Failing to run four minutes faster has since seen those privileges revoked. In spite of this, she is intent upon meeting qualification standards to race in the Rio Olympics in 2016 and the Gold Coast Commonwealth Games two years later. The winning marathon display of 39 year old European Champion Christelle Daunay in Zurich will have added further to her own belief that female distance runners “can keep on at a high level, and even improve, up to the age of 40.” Not that Ganiel draws inspiration from veterans alone. She is just as enthusiastic on the promise of fellow Games counterpart Katie Kirk. Ganiel cherished the 20 year old Co. Down athlete’s small semi final victory of finishing sixth over 800m with a lifetime best – despite failing to qualify for the Commonwealth Games Final. Away from the track, Ganiel’s devotion to peace and reconciliation at a grassroots level spur small victories in others. The journey toward peace in her adopted land is a long one, but then a marathoner wouldn’t have it any other way. 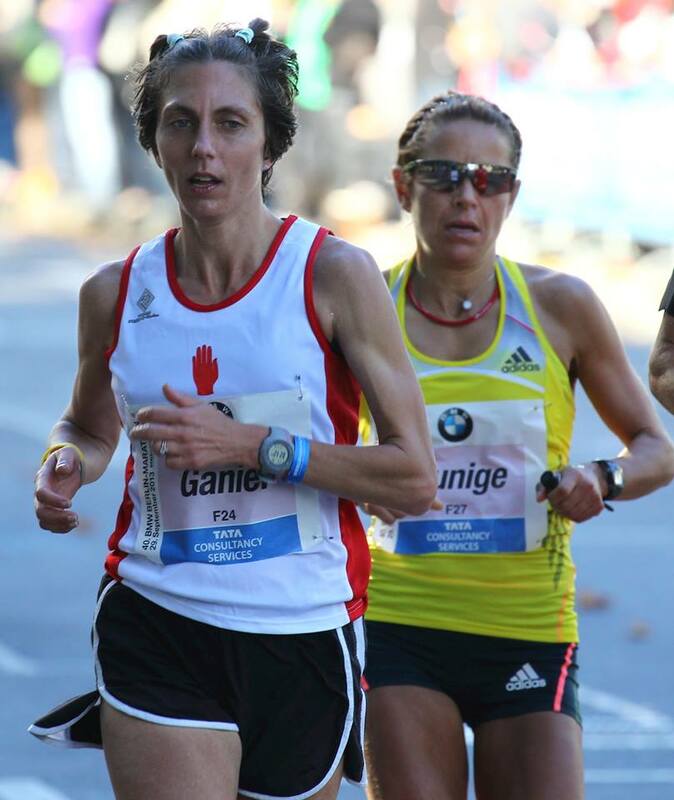 Gladys Ganiel on her way to qualifying for the Commonwealth Games with a PB of 2.39 at the Berlin Marathon in September last year.